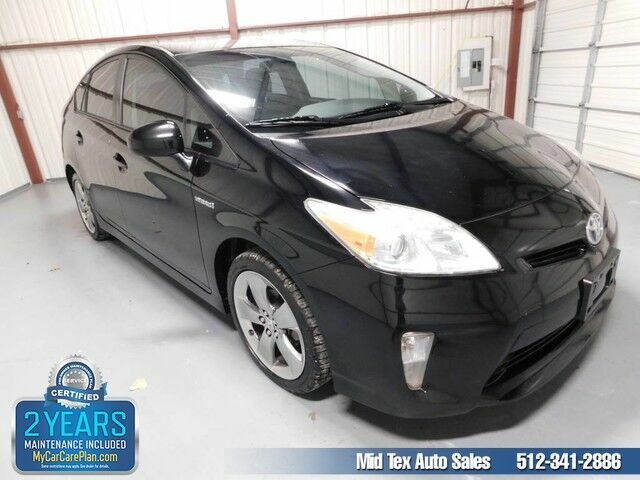 Mid Tex Auto Sales is excited to offer this 2013 Toyota Prius. Your buying risks are reduced thanks to a CARFAX BuyBack Guarantee. The Toyota Prius Five is economically and environmentally smart. Toyota clearly delivers on its promise to provide a fuel-efficient vehicle that has the great qualities you need in a vehicle. Look no further, you have found exactly what you've been looking for. More information about the 2013 Toyota Prius: The Prius has set the standard for hybrid-powertrains in the U.S. since it was introduced. The current model is the most efficient, most reliable Prius yet has proven to be an amazing bargain. With several Prius variations from which to choose, the winning hybrid powertrain appeals to even more car buyers. Anyone who thought the original Prius was too small should look for the Prius v. Customers looking to maximize their fuel economy would be advised to consider the Prius Plug-in. Both feature Toyota's reliable, efficient hybrid technology at a reasonable price. Strengths of this model include proven reliability, new models provide cargo and passenger flexibility, and Leading fuel economy Visit Mid Tex Auto Sales online at www.midtexautosales.com to see more pictures of this vehicle or call us at 512-341-2886 today to schedule your test drive.